The Hawaiian cotton tree is a spectacular member of the hibiscus family. Growing to a height of 10 m it has star-shaped leaves and large red flowers. It is also one of the rarest trees in the world. 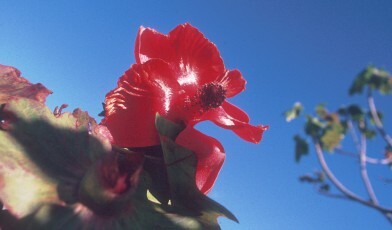 Traditionally Hawaiians have used the bark of the cotton tree to make red dye that is used to colour fishnets. It is also used as a medicine to prevent thrush. The species is well established in cultivation following the dispersal of large numbers of seeds to botanical gardens all over the world in the early 1900s and is sometimes used as a garden and ornamental plant. However, in its native habitat, the species is extremely threatened. Hawaii’s dry forests have decreased by almost 90% and 10% of Hawaii’s native plants from these forests have already been lost to extinction. Today, only four individual cotton trees grow in the remaining dry forest, near the lava fields at Pu’u Wa’awa’a and Kaupulehu in the North Kona district. Threats to the species include browsing by feral animals preventing the growth and establishment of young trees, wildfires and fountain grass (Pennisetum setaceum) – an alien species that has now covered the once barren lava substrate. Fountain grass also helps to fuel wildfires and competes with native tree seedlings for light and water. Out of Hawaii’s 293 threatened native plant species, the cotton tree is one of three species for which the US Fish and Wildlife Service has designated habitat critical to the survival and recovery of the species. Following the designation of critical habitat, management goals for the species include the reduction of threats of fire and damage by animals, habitat improvement to encourage natural regeneration and the planting of trees that have been raised in nurseries. The state and federal government is also considering an alternative route for a proposed saddle road realignment that will avoid rare dry forest and habitat for the species. Wagner, W., Herbst, D. and Sohmer, S., 1990. Manual of the flowering plants of Hawaii. University of Hawaii, Bishop Museum Press, Honolulu. 1853 pp. Fruit from the baobab tree has been called the new ‘superfood’ on the international market after it was approved for use in smoothies by the European Union in 2008. Read more about trees valued for a source of food.